Which Banks Will Be Hiring Across the Atlantic in 2011? Tis the season for best of the year lists, top 10 of the year lists and predictions for what will happen after the ball drops. 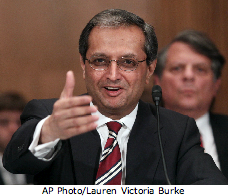 To that end, in what has to be one of the best comebacks of the year in banking, and one of the top 10 turnaround stories in any sector, the Vikram Pandit-led New York-based Citigroup is being predicted as the bank that will have the most hiring power across the Atlantic in 2011. That's right, Citi, the former poster child for the credit crisis and worldwide financial meltdown, is now a "firm on a mission" and next year will be significantly beefing up its staff in Europe (as well as in Asia, as has been previously announced). In addition, the U.K.-based Standard Chartered, a little known firm in the U.S. but a well known one overseas, is being seen as a bank that will deepen its European talent base next year. Standard Chartered, largely unaffected by the crisis, will be able to continue to offer employees big paydays and thus should attract some big-name bankers its way. RBC Capital Markets, another lesser known firm in the U.S., is also being predicted as a big hirer in Europe. Thanks to its parent company's stong balance sheet, the investment bank made some key hires this year, and is expected to continue to add bodies in 2011.